This map will display the upstream and downstream activities and facilities/infrastructures of the country. 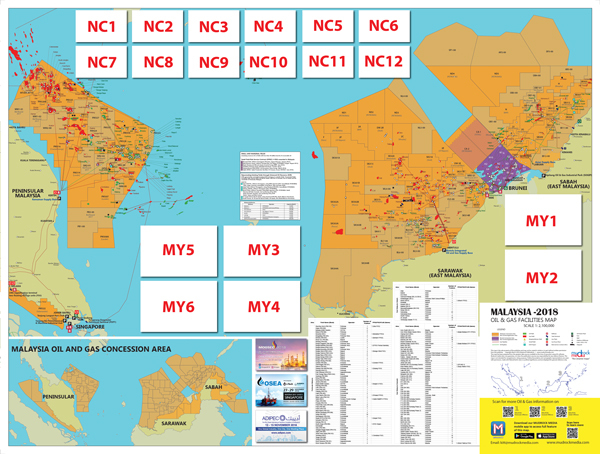 Map with proportionally sized symbols represent data associated with point locations for Petroleum Contract Area, Oil Field and Gas Field, Pipeline for oil & gas, Infrastructures such as Refinery, Gas Plant, Power Plant, Tank Terminal, Port, FPSO and Platform (label with name and operator, full list in table format). 1) Six (6) Single Premium Ad Spot: 12cm width X 8cm height. 2) Twelve (12) Name Card Ad Spot: 8cm width X 5cm height. 3) Cover Ad Spot A: 18.8cm width X 13.97cm height. FREE ONLINE E-BANNER FOR LIFETIME WITH HYPERLINK! !